From the 'Product Tools' section, click One Talk. From the dropdown, select the appropriate group then click the Features tab. 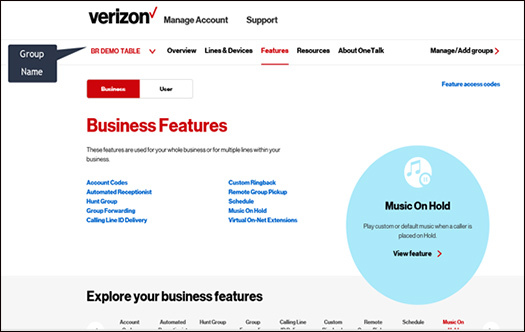 From the 'Business Features' section, select Music On Hold. Click the Feature Settings switch to enable o deshabilitar . To record your own music or announcement, we recommend downloading and using the Broadsoft Recorder (searchable under that name from the Apple® App Store® or Google Play™ Store). The Broadsoft Recorder formats the recording for you, so it is simple to use. 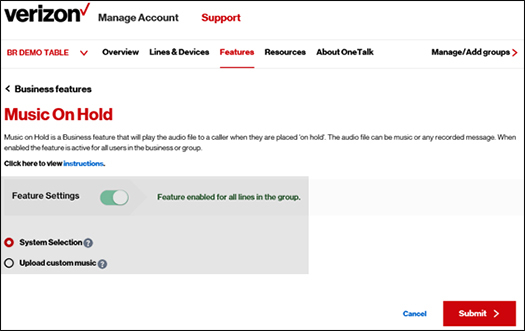 Alternatively, you can use other programs and applications such as G711.org to format existing Digital Rights Management (DRM) free audio files to the correct specifications. 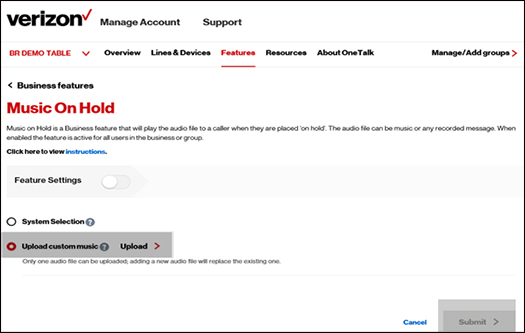 From the 'Music On Hold' page, select Upload custom music. Click Upload then select the appropriate music file from your computer.